Parishioners, family and friends are invited to join the fun with all our Monroe Episcopal Youth Groups (EYC - Episcopal Youth Community) at Grace Church on Sunday, September 30, 2012 at 2:00 p.m.! 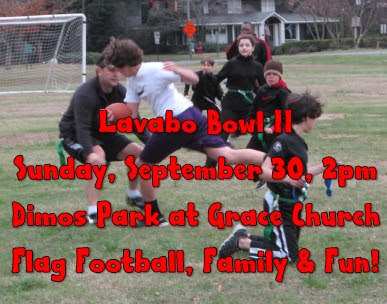 The Lavabo Bowl II (Flag Football Game) will be played in Dimos Park (Grace Lower School Playground). Sign-up for the Protestant Panthers (black) and Catholic Cougars (white) by calling the Grace Church Office (387-6646). Cheerleaders, Referees, Photographers and Spectators are also needed! Let’s KICK OFF a great year of working together!